Broadband your WAN and dramatically reduce costs. World class cloud based wireless platform as a fully managed service. Instant optimised connectivity for remote or temporary locations. ALL Application Optimisation delivering multiples of virtual bandwidth. Securely protecting your company data within a cloud environment. Cloud Managed Services delivering innovative world-class Gartner Magic Quadrant technologies, for ALL Applications Optimisation, across ALL IT infrastructures, including Managed WiFi and Secure Data Backup solutions. 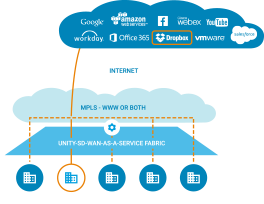 UNITY 'SD-WAN-as-a-Service' enables enterprises to dramatically reduce their WAN cost and complexity by leveraging broadband to connect users to ALL applications. Optimisation as a Service ensures you receive the bandwidth capacity you pay for - and much more - via unique technologies. World-class technology delivers a true Cloud based wireless platform as a Fully Managed Service. Optimised connectivity of ALL Applications within 5 minutes of arriving on site. A tailored solution, using existing infrastructure, and protecting all data in a Managed Cloud environment. High-speed application access from any location on any device, without installing new hardware or reconfiguring your network. Solution allows consistently good working experience even at remote sites with low levels of 3G signal. EcoLogic delivered the Cisco Meraki platform to provide real-time access to patient records and reliable internet connectivity. EcoLogic integrated the OaaS and Cloud WiFi QoS platforms - true DC to end user performance. Just what is SD-WAN? Answer: Software-defined WAN (SD-WAN) is an approach to designing and deploying an enterprise wide area network (WAN) that uses software-defined networking (SDN) to determine the most effective way to route traffic to remote locations. According to the latest report from the world’s leading information technology research and advisory company, Gartner, the SD-WAN market is predicted to explode within the next few years. Ecologic’s SD-WAN offering, with integrated ‘OaaS’, enables Broadband connectivity to deliver a better end user experience than MPLS networks! What’s more Zero-Touch deployment allows enterprises to provision and manage WAN connectivity to retail outlets centrally. @COMobileIT Delivering a Rapid Deployment "GAME CHANGER" Mobile SD-WANaaS in 5mins-ALL APP OPTIMISATION OVER MULTI-CELLULAR CONNECTIONS! @COMobileIT what an excellent event, full of technical innovation and thinking 'outside the box' to add massive value to construction! Sign up for our newsletter to receive latest updates and news from EcoLogic.